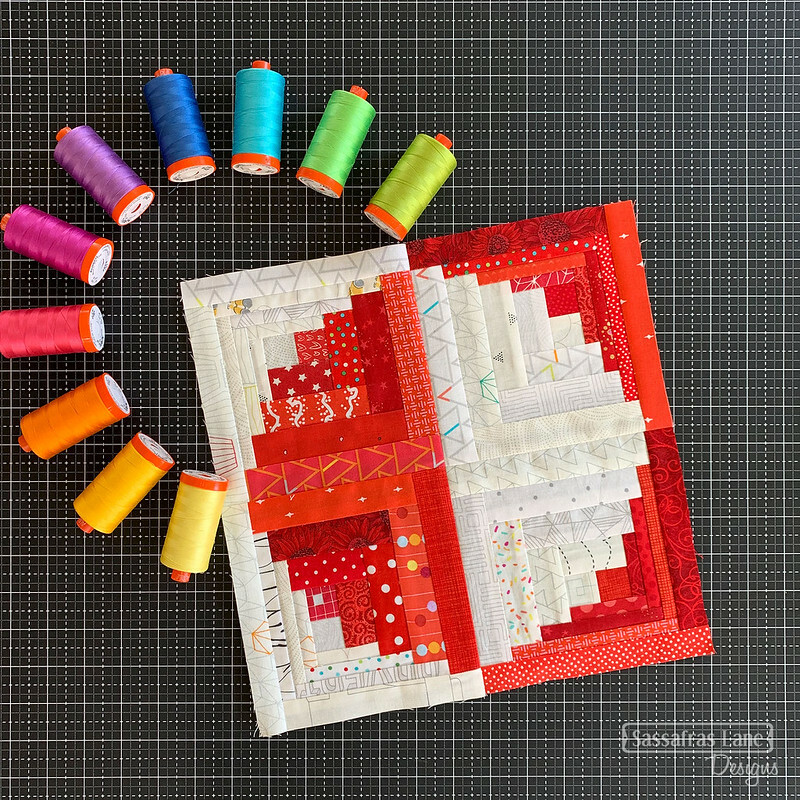 We are super excited and honored to be a part of the 2019 Aurifil Designer Block of the Month team! Each year Aurifil invites 12 designers to create a quilt block that is part of a theme and April is our month! Pat Sloan coordinates the program, puts all the blocks together at the end for a creative finished quilt and makes a different of each block as they are posted. This year's theme is TRADITION, so each designer is creating a block that is inspired by a tradition that is important to them. The rules were: 1. The blocks be mostly red and white with a splash of an accent color if you choose, and 2. The blocks are all 12-1/2″ unfinished. Red is strangely a color we don't have many scraps of, but we made it work. Here is our block! We decided to do a twist on the traditional log cabin that represented our not-so-traditional dual design team! We are two halves that make a whole and that is represented in our block, Tradition with a Twist. We combined low volume and red scraps in this fun foundation paper-pieced block. In addition to a great free block each month, Pat puts together a great interview of each designer over on the Aurifil Blog and gives away a free box of thread (the BIG spools!). READ ALL ABOUT OUR INSPIRATION FOR THIS BLOCK, OUR INTERVIEW AND GET THE FREE PATTERN HERE!